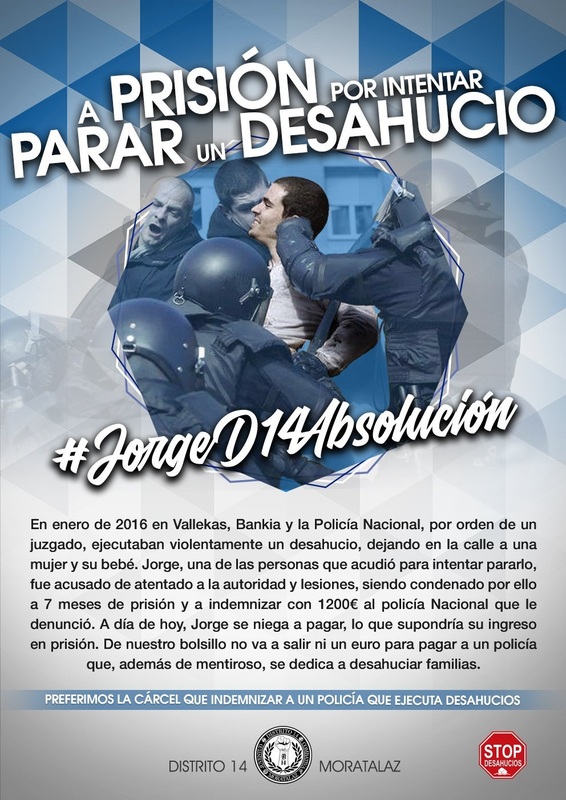 Article translated from the Madrid-based anarchist publication Todo Por Hacer relating to the likely jail time faced by anti-eviction activist Jorge Jiménez from the anti-capitalist, feminist and anti-fascist collective Distrito 14. One of the principal results of the 15M movement that emerged in 2011 was the boost it gave to struggles around housing. The first two to three years of 15M were characterised primarily by the movement in this sector, as well as participation in the general strike of 2012 and various other mass mobilisations. Every day evictions were prevented (and although there has been some loss of momentum, the activity of groups like the PAH continues unabated), and the question of housing leapt to the forefront of national attention. Throughout this time, we have been subject to arrests, charges, trials and fines for taking to the street and helping out our neighbours. The Citizens’ Security Act (the infamous Ley Mordaza) was even modified to include the specific infraction of stopping an eviction. There have been various measures taken to repress us, and there have been tens or hundreds of comrades who have faced sanctions of some sort. But as far as we know, till now no one has been jailed for trying to stop an eviction. Jorge Jiménez, member of the District 14 collective, could be the first such case. Jorge was one of those who showed up in January 2016 to try to stop the eviction of Massiel and her two children in Villa de Vallecas. 50 people formed a human chain in front of 20 police. Speaking to El Salto, Jorge related the basis of his arrest: ‘After violently removing us from the entrance, the officer accusing me affirms that he was helping an elderly man to his feet when I approached him, looked him in the eye, and stood on his hand. This is a lie.’ Jorge was not arrested that day. Two days later he received a call from the National Police asking him to report to the station. ‘I went voluntarily because they told me that otherwise they would come to my house or workplace’, he explains. The police accused him of assaulting an officer, for which he was tried in February 2018. In March his sentence was read: seven months in jail, a fine of three euros a day for a month (90 euros), and a payment of 1237 euros in compensation to the officer in question. The provincial court rejected the possibility of an appeal, and on 20 September La Haine revealed that all legal routes had been closed off with the Supreme Court not permitting the annulment of the sentence. On 25th September, Jorge will appear before the Criminal Court and be instructed as to his options: he can request a suspended sentence, but only on condition that the compensation is paid to the police officer. Jorge has already indicated that he has no intention of paying anything, firstly because he is innocent of the charges against him and secondly because he has no desire to give money to someone employed to evict people from their homes. For this reason, it is highly likely that the sentence will not be suspended and that he will be sent to prison. On 27 September Distrito 14 will hold a press conference to update us on the situation.